On the last day of his official state visit in Japan, the president of Republic of Indonesia, Mr. Joko Widodo (Jokowi) took the opportunity to visit Toyota factory in Nagoya, Japan. As soon as he arrived, President Jokowi accompanied by First Lady Mrs. Iriana directly welcomed by Toyota Motor Corporation President, Mr. Akio Toyoda. Both then continue the meeting in a separated room and took lunch together. President Jokowi then explained that he asked Toyota as one of the biggest automotive company in the world which operates in Indonesia through PT Toyota Motor Manufacturing Indonesia (TMMIN) to be able to develop Indonesia as global manufacturing base for exporting vehicles. “I met with President of Toyota, Mr. Akio Toyoda, and I ask that Indonesia can be used as a special product service for export,” President Jokowi said, as reported by Cabinet Secretary's official website, Wednesday (25/3/2015). On such occasion, President Jokowi accompanied also by several ministers and government officials among others were Coordinating Minister for Economy Sofyan Djalil, Cabinet Secretary Andi Widjajanto, Minister of Foreign Affairs Retno Marsudi, Minister of Trade Rahmat Gobel, and the Minister of SOEs Rini Soemarno. 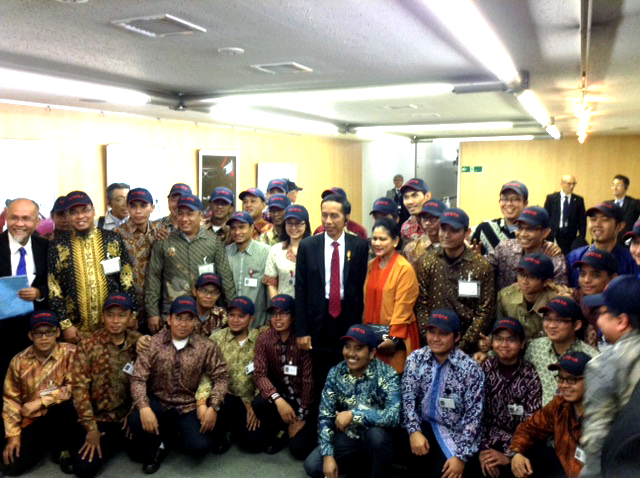 This visit to Toyota ended the series President Jokowi's official state visit in Japan.